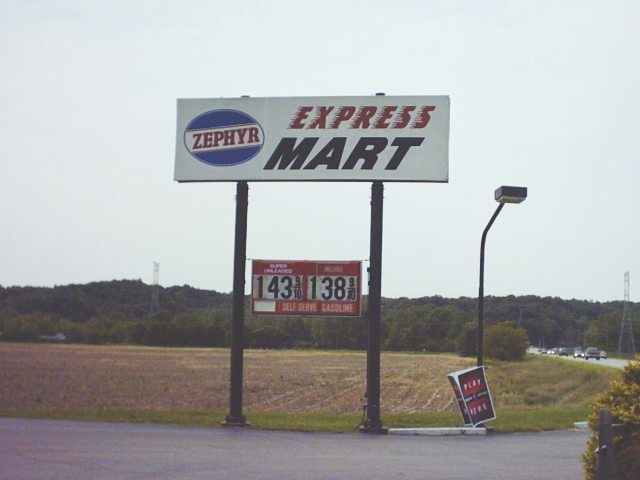 A Zephyr Express in Sullivan, Missouri. Photo taken April 20, 2008 by David Backlin. A second view of the Zephyr Express in Sullivan, MO. Taken April 20, 2008 by David Backlin. dating back to 1939 when the J. D. Streett Co. in Maryland Heights, Mo. 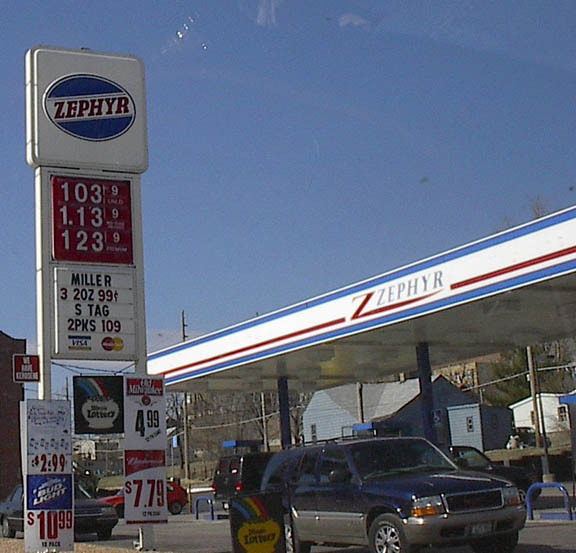 C-stores, but the ZEPHYR brand continued at a limited number of sites. but I think that is a jobber operation of some kind through Street. of the NATIONAL PETROLEUM NEWS in February 1984. TOP.........U. S. 41 north, with a old "stand alone" sign mounted on the canopy. 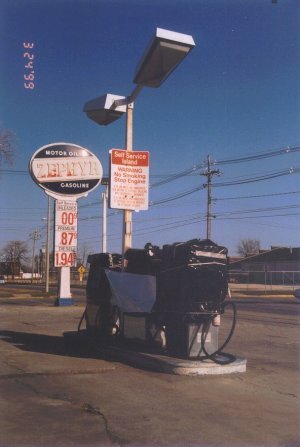 BOTTOM.......Close up of the store & pumps at the N. Lafayette Ave. location. 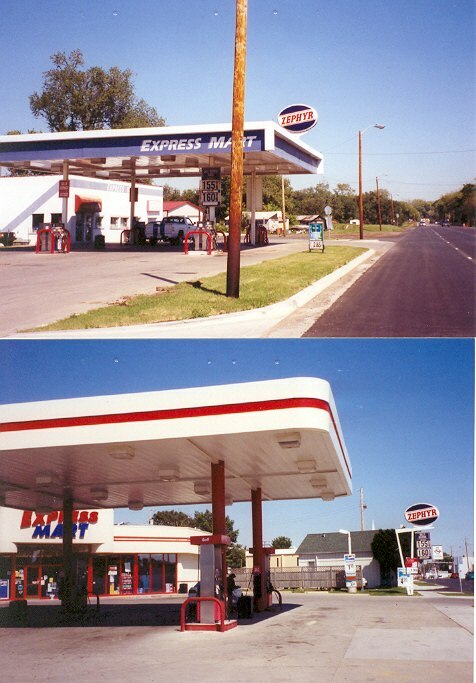 Photos taken Sept. 17, 2003 by Walt Wimer. Above information contributed by Walt Wimer. Here are some close-ups of the signs at the above Terre Haute ZEPHYR stations. logo of the early 50s had speed lines and shading on the right hand side. Sometime between 1963 and 1966 the shading and speed lines were dropped. dropped the "motor oil" and "gasoline" wording from the logo. all five stations although the station may be about the newest building-wise. This sign would have dated somewhere between 1966 and 1970. Pretty long ago to still be in use in 2003!! speedlines or the wording in the blue areas. Still it probably dates back to the 70s. at both of the sites with the sign mounted on the canopy. BOTTOM......This is the odd ball of the bunch and probably much newer. of the five in the Terre Haute area. They had two of these signs, one for each street. and a small ZEPHYR logo. 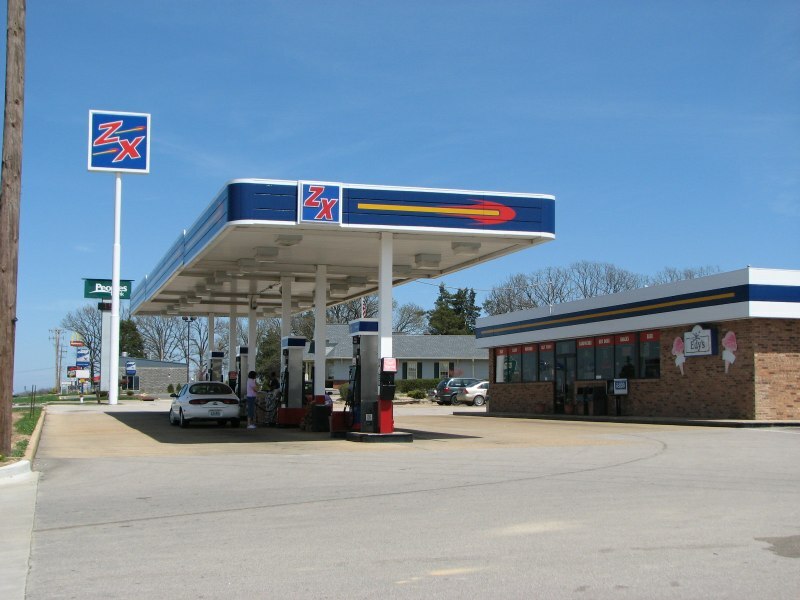 Here are two ZEPHYR stations located on US 40 going through West Terre Haute, Indiana. was once some other brand. They are both on the right hand side going west through town. north in Terre Haute, and I believe is the older of the two sites. leads me to think they could have been PHILLIPS 66. All above photos Copyright © 1999 by Brad E Harms. Used by permission. 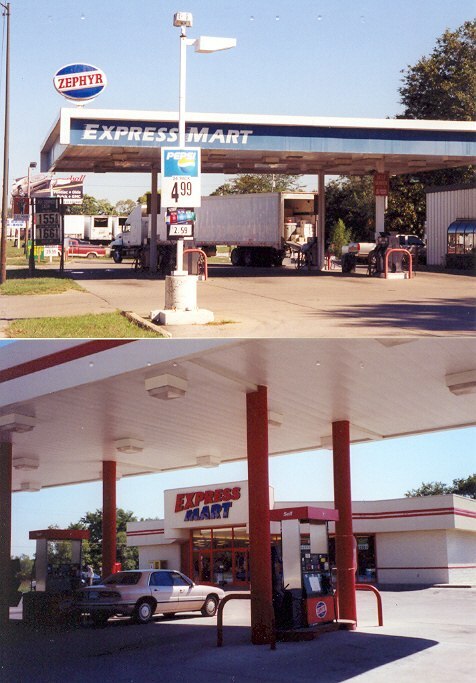 Photos taken in Galesburg, Illinois shortly before station was dismantled. 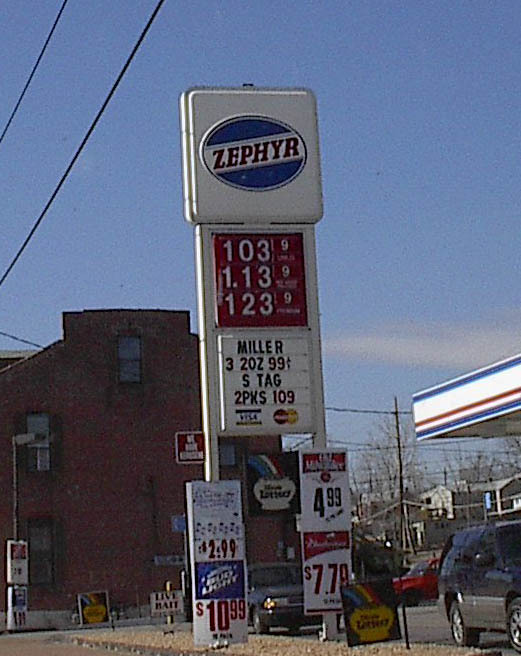 Three photos of a Zephyr station on Broadway in Alton, Illinois. Photos taken on Feb. 23, 2002 by Rich Piehl. 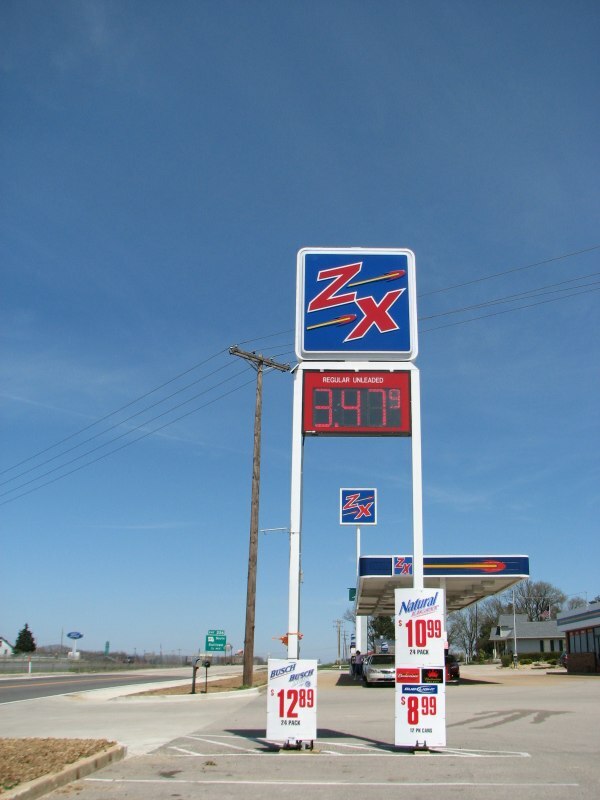 Note: The above blue oval Zephyr signs are a brand marketed by J. D. Streett and Co. of Maryland Heights Missouri. 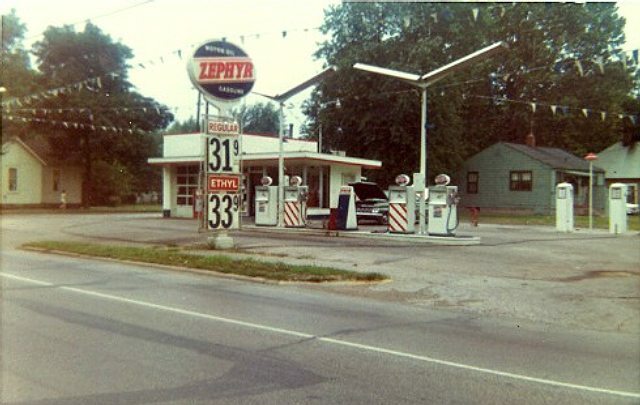 Two shots of a Zephyr station on Indiana 39 just west of Martinsville, Indiana. 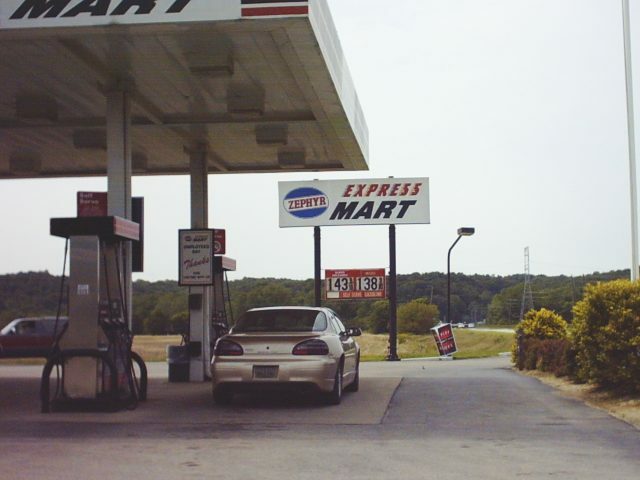 Taken on June 1, 2003 by John Cirillo. Zephyr in northern Illinois, possibly near Joliet. 1959 photo by Walt Wimer. 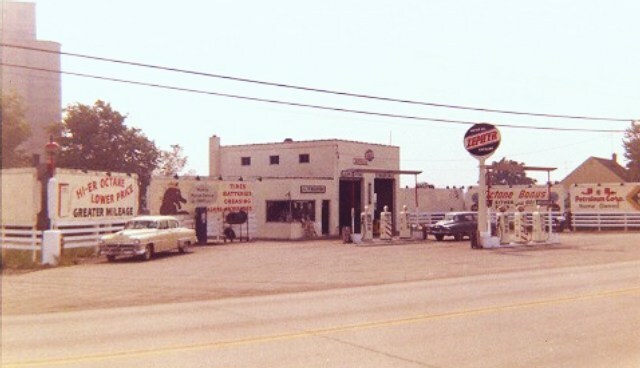 Walt writes: Note the porcelain sign, globes and candy stripe pumps. went to their own brand?? Also note the high bays...they must have catered to trucks. 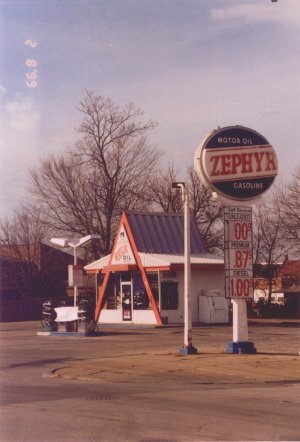 Zephyr in Vincennes, Indiana. Taken July 9, 1967 by Walt Wimer. 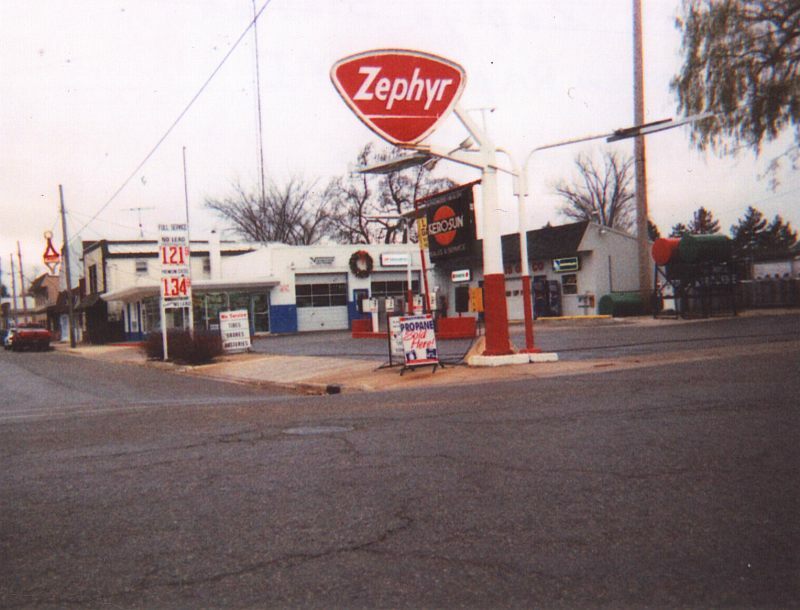 Zephyr in Davenport, Iowa, on Rockingham Road. Taken Sept. 16, 1984 by Walt Wimer. 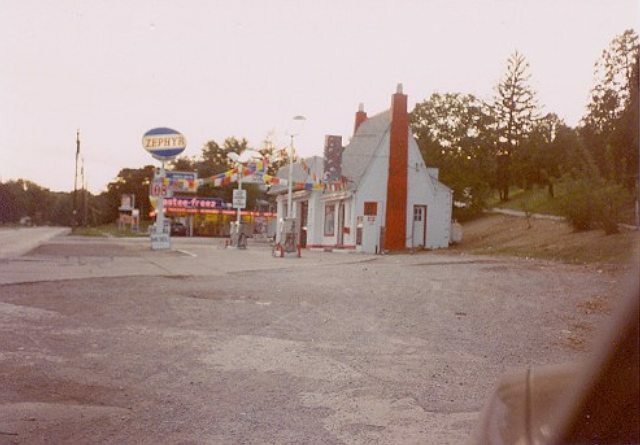 Note the Tastee Freeze restaurant in the background! Pure's territory so this is likely. (Thanks to David Serra for Pure info). Photo was taken around dusk and the sign (without wording) is already lit. Rockingham Road was not a numbered highway, but probably was at one time. Note from Phil Case: Rockingham Road was US 61 prior to 1958.
its old Rockingham Road alignment." 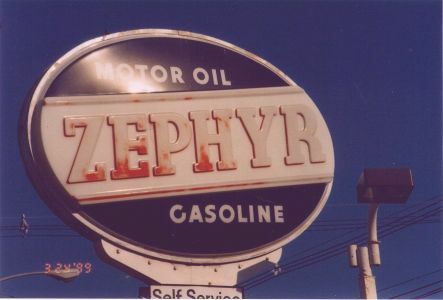 A 1950's Zephyr logo from David Backlin. This red triangular Zephyr is from Naph-Sol Refining Company of Muskeon, Michigan. by Wayne Henderson and Scott Benjamin. 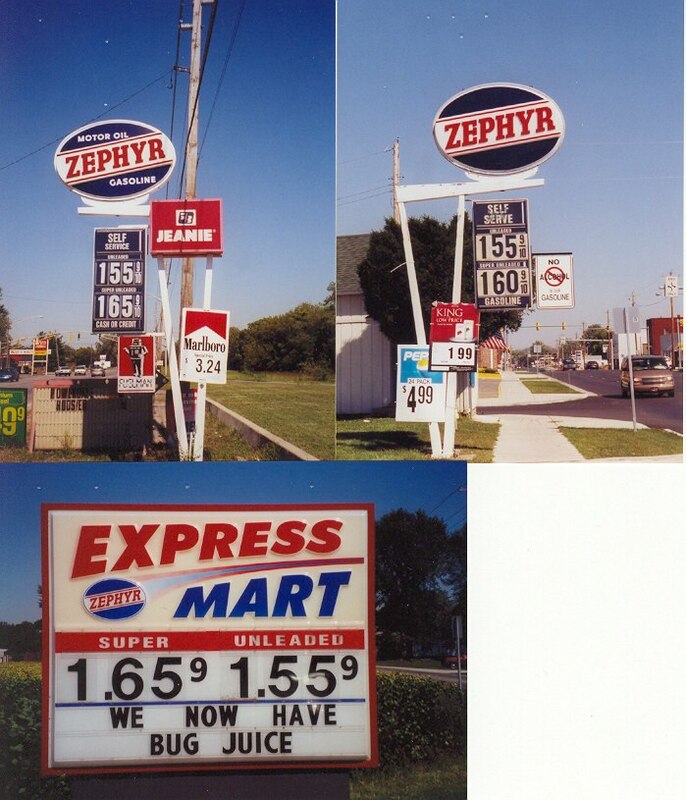 Thanks to Bill Heger for explaining the differences in the two Zephyr brands. 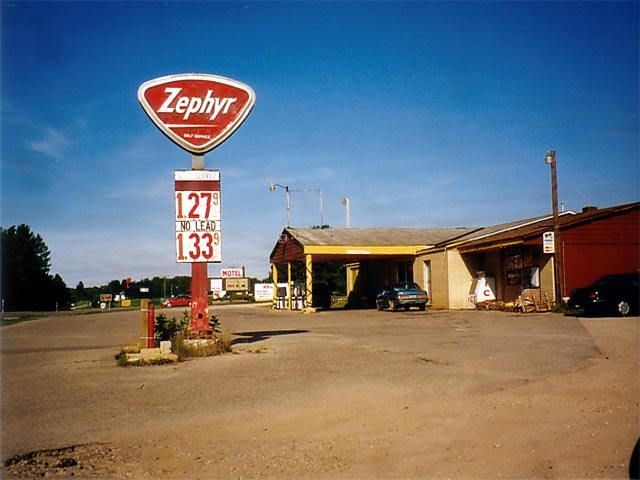 A Zephyr located on Michigan State Highway 28 in the Michigan Upper Peninsula. Taken Sept. 1997 by Noel Levy.